Unfortunately, I was only able to get on the water one day this week. Erik and I left Clover Pass Resort in a skiff on a wet and windy Wednesday. Temperatures were in the low 50’s, with some gusty wind and a steady rain. We stuck to the area between the lodge and Survey Point, each of us fishing a banana weight set up. Right away, I had a pink salmon in the boat, not very big, but with a great chrome color. There were plenty of other boats in the water around us, including a ton of our skiffs, and it seemed like a number of fish were being caught in the area. We got started a couple of hours before the tide change and fished through until about an hour after. in all, we pulled in three pink salmon between the two of us, having lost a few at the boat. Lots of fish being caught by our guests at Silverking Lodge this week, including a 26.4 pound king and a 28.6 pound chinook, both caught from our 14′ Livingston skiffs. I have some family in town this week, so we will be hitting the water hard all weekend. Check back next Thursday to see how we did on another Ketchikan Fishing Minute. Oscar and I were at it again this week. On Tuesday, we fished from a 14′ Livingston out of Clover Pass Resort, mostly around Survey Point. We got a little bit of a late start that day, but were still in the water ahead of the tide change. I stayed with my Coho Killer while Oscar mostly fished cut-plug herring. There was a little magic left in the Coho Killer, as I brought in three pinks and a chum. Unfortunately, Oscar’s luck ran out and he got skunked for the day. We had heard a lot of good reports about the fishing around Skin Island and Caamano Point recently, so on Wednesday, Oscar and I took one of Clover Pass Resort’s yellow boats To investigate. We started by crossing Clarence Strait to give Skin Island a shot. Oscar utilized the downrigger while I continued with my banana weight set up. On our first pass, Oscar hooked in to a fourteen pound king salmon, while I lost a couple pinks near the boat. We had a few more bites, and Oscar landed a pink while we were there, but we weren’t getting the action we had hoped for. About an hour before the tide change, we decided to run back across and see what Caamano Point had to offer. We were marking fish regularly, but not getting a ton of strikes. Oscar pulled in a good sized chum salmon, leaving him with just a silver to go for his second grand Slam in as many weeks. I was the one that landed the coho however, insuring a reward for my efforts that day. A report from Alaska’s Fish and Game Department on Tuesday said catch rates for silvers, pinks and chum were picking up and that they should continue to improve through August. I’ll hit the water again over the next few days, and give you the report on Thursday, in another Ketchikan Fishing Minute. So far this year, we have focused primarily on fishing king salmon, since that run peaks in June. Around the first of July, we tend to see pinks and silvers move into our waters as the kings move out, and that has been the case this year. I often recommend mid-July as a great time to visit, because you have an opportunity at all the Pacific salmon species during that time. I hit the water Monday morning in a Clover Pass Resort “Yellow Boat” with my friend Erik. We trolled the area out by Tatoosh rocks, and right away, I brought in my first pink salmon of the year. Usually pinks in early July are bright chrome and not showing any signs of their upcoming spawn cycle, but this one was already developing a decent hump. Over the course of the morning, we brought five more pinks in, along with one coho and one chum. Erik was utilizing a downrigger while I fished with a six ounce banana weight. Of the eight fish we brought in, six were caught on the banana weight set up. On Wednesday, Oscar and I left Clover Pass Resort in one of the Livingston skiffs and headed to Survey Point. The Livingstons do not have downriggers, so I was again using a banana weight while Oscar dropped his line using a diving weight, in this case a Deep Six. Typically, the diving weights are better at getting your line down deeper than a banana weight can, so my line was probably closer to the surface than Oscar’s. The wide variety of salmon species was on display that morning, as I brought in three silvers, three pinks and two chum, while Oscar hit the grand slam by bringing in a king salmon to go along with his two pinks, two coho and a chum salmon! The ability to catch numerous salmon species, and to do it easily in our fourteen foot skiffs, is another great reason to visit Silverking Lodge and Clover Pass Resort in July and early August. Our reasonably priced, self-guided packages will allow you to create memories that last a lifetime – and fill your freezer! In addition to the weekly fishing reports, I will be developing some supplemental videos that describe a few of the techniques we use while fishing for salmon and halibut. Be sure to check back for those, and check back next Thursday for another Ketchikan Fishing Minute. 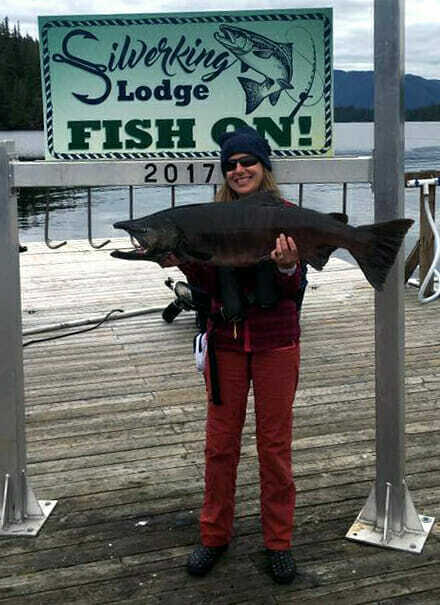 Welcome back to another Ketchikan Fishing Minute. I hit the water on Tuesday this week, fishing from about 7:00 AM through the morning tide at 9:50 AM. My friend Erik and I trolled near Tatoosh Rocks, hoping to get into something other than jack kings. With July quickly approaching, we were hoping to see some pinks or silvers moving into the waters around Clover Pss Resort. Erik started out with a black and white hoochie, while I fished with a black and white coho killer. I have been using that almost exclusively since the beginning of the season and been having pretty good luck with it. Right away we got into a school of shakers. They were hitting almost as fast as I could get my line in the water. While I assumed most of these fish to be little kings, I was checking them a little more closely this week to be sure they were not another species. I finally got a strike that was pulling some line off my spool, hopeful that a chinook with some size was on the other end. As it approached the boat, I was disappointed because it was clearly smaller than the 28 inches necessary to keep king salmon. We still netted it just to be sure, and to my surprise, we had landed a nice little silver salmon. Silvers, also known as coho salmon, have white gums and spots only on the upper lobe of the tail, while kings have black gums and spots on both the upper and lower lobes of the tail. It was encouraging to see silvers this early in the season. Hopefully we’ll see quite a few of those in July, along with the pink salmon we always get during the month. I will be catching a ride with Captain Shane Klinger out of The Cedars Lodge this week, in addition to doing some more self-guided fishing around Clover Pass Resort. I will give you the report next week on another Ketchikan Fishing Minute. Welcome back to another Ketchikan Fishing Minute. The 70th annual Ketchikan CHARR King Salmon Derby wrapped up this past Sunday, and Chase Hanis held on through the third weekend to secure the top spot. 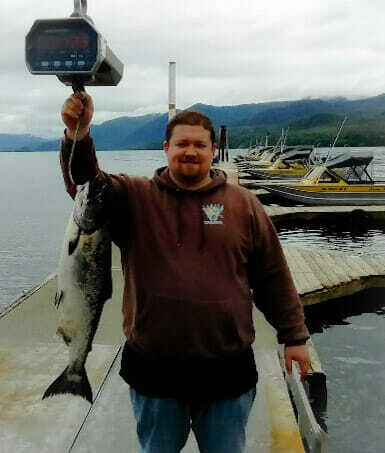 His 43.7 pound king was caught early on day five, and that fish will net Chase a $10,000 check in addition to two tickets anywhere Alaska Airlines flies. Other notable names on the ladder include good friend of Clover Pass Resort, J.B. Ruth, who ended up with the third largest fish brought in this year. James Shilts won the Silverking Lodge Special Prize, awarded to the angler that turned in the 32nd fish caught overall – in honor of Silverking Lodge’s 32 years in business. Ric Boyd’s 33.8 pound king finished in fourth place on the ladder, but since Ric is a Permanent License Holder and he caught that fish from a skiff of less than sixteen feet, Ric ended up on top of both of those categories. Oscar and I hit the water Saturday, and as has been the case throughout the derby, we pulled a number of shakers up to the boat. Oscar got a fish on the ladder that day when he pulled in a 10.2 pound king. More than nine hundred fish were turned in over the three weekends, nearly 75 fish more than last year. The king run will start to taper off over the next couple of weeks, but we’re already starting to see some coho come across the dock. As the early silvers and pinks start to show up, we’ll be on the water to bring you all the action on another Ketchikan Fishing Minute. 66th Annual Ketchikan King Salmon Derby Under Way! The salmon season officially began this past weekend as the 66th Annual Ketchikan King Salmon Derby kicked off on Saturday. This year’s ladder totals more than $90,000 in prizes for participants, including the $10,000 grand prize for catching the largest king! Communities all over Alaska take great pride in their annual King Salmon derbies, and Ketchikan is no exception. This year’s derby starts, as usual, on Memorial Day weekend (May 25-27), then continues for the next two weekends in June (June 1-2 & 8-9). Michael Briggs caught the first fish of the derby on Saturday, a 28.3 lb king salmon. That fish tumbled down the leader board as the weekend progressed however, and Michael currently finds himself sitting in 8th place with two weekends left to fish. Ketchikan local Brian Thompson is the derby leader after the first weekend. His 40.0 lb king was weighed at Clover Pass Resort on Sunday morning. This fish would have finished in 2nd place had it been turned in last year. We will see if Brian can hold on to the top spot for two more weeks! Beyond the cash prize of $10,000 for winning this year’s derby, there are another thirty prizes available on the adult ladder, ten spots are up for grabs on the youth ladder, plus there are special prizes like hidden weights, largest fish caught from a skiff 16′ or smaller, permanent license holders, and more!! Adult tickets are only $35, and kids fish the derby for free when accompanied by an adult ticket holder. For more information, visit the derby website or Facebook page!! And don’t forget, derby participants can have their catch processed by Clover Pass Resort or The Cedars Lodge for FREE when they present their valid derby ticket.